After my attack I developed this techinque for handling all the advice being thrown at me. How I should heal, how long it should take me to be over it, and even being told to not let this ruin my life. It was the best response I could find. I felt it acknowledged that I heard what was said but also allowed little space for more advice to be offered to me. A lot on the Appalachian Trail. There is almost nothing out here that someone hasn’t titled themselves the director of. This hike is hard enough when you are a go with the flow type, thif must be excruciating for those trying to control every little thing that is happening. Having Leo with my some how has marked me with a sign that says, “please come up and tell me how to care for my puppy” People will turn him over, touch him, and then tell me I shouldn’t have him out here. He should be at home chilling instead of outside hiking. Anyone who has actually spent time with this pup knows that he is an outdoor dog. He wants to be rolling around in leaves, chewing sticks, and walking the trail. 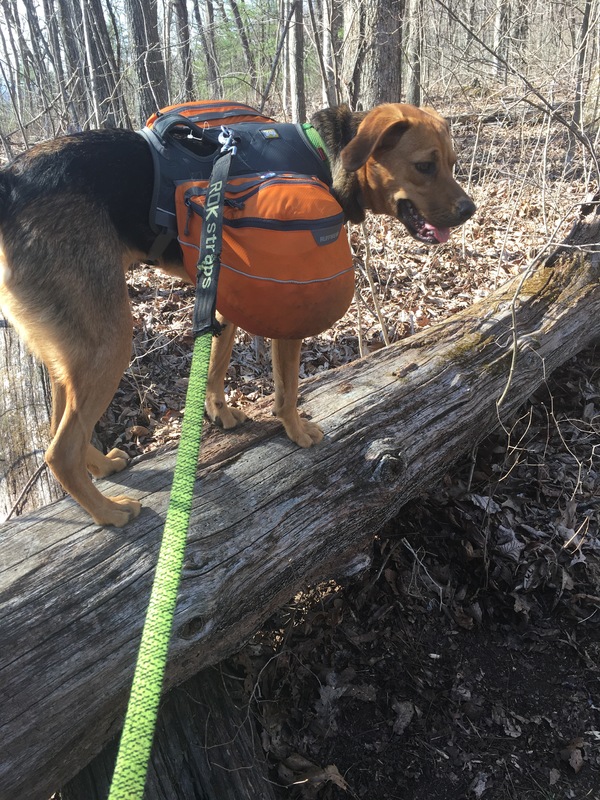 Adventure hound jumped up on this log with a full pack.